Make the pâte brisée: combine flour and salt in the bowl of a food processor and blitz to combine. Add the butter and pulse until mixture resembles coarse crumbs with some larger pieces of butter, about 10 seconds. With the machine running, add the water through the feed tube in a slow, steady stream, just until the dough holds together without being wet or sticky – do not process for more than 30 seconds. Squeeze a small amount of dough together – if too crumbly, add a bit more water, 1 tablespoon at a time. Form dough into a ball, divide in half, then shape into two flattened disks. Wrap in plastic wrap as refrigerate for at least 1 hour or overnight – dough can be frozen for up to 1 month; thaw in the refrigerator overnight before using. Preheat the oven to 180°C/ 350°F. Place the garlic on a large piece of foil, drizzle with 1 tablespoon olive oil and fold the foil to encase the garlic – seal the edges well. Place onto a small baking sheet and roast for about 45 minutes or until garlic is soft. Remove from the oven and set aside. When garlic is cool enough to handle squeeze the cloves out of their skins – do not discard the olive oil left in the foil. Place garlic in a small dish or bowl and mash with a fork. Set aside. Roll out the dough between two sheets of lightly floured baking paper to a rough 35x15cm (14x6in) rectangle. Transfer to a lightly buttered 30x10cm (12x4in) tart pan and press into the edges. Trim dough flush with the top edge of the pan and prick dough all over with a fork. Freeze tart shell for 40 minutes. Preheat the oven to 220°C/425°F. Spread the roasted garlic evenly on the bottom of the chilled tart shell. Sprinkle with ½ cup of fontina, then arrange the tomato slices over the cheese. Season the tomatoes with salt and pepper. Place a few sprigs of thyme over the tomato slices and cover with the remaining cheese then drizzle with the garlic infused oil. 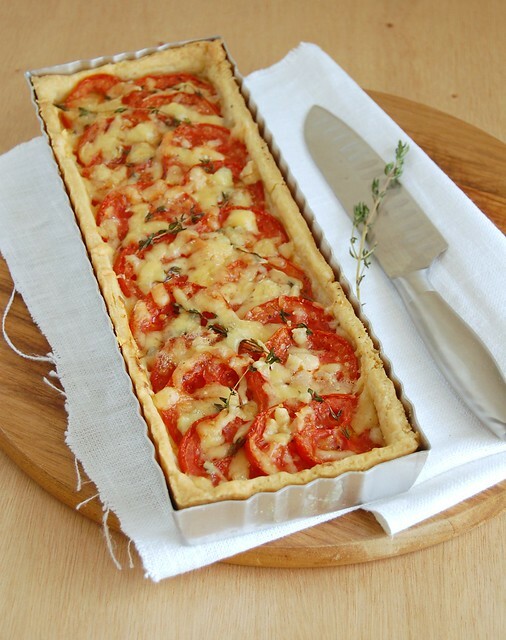 Bake tart until crust is golden and tomatoes are soft but still retain their shape, 35-40 minutes. Cool on a wire rack for 20 minutes then serve warm. Gorgeous photo! I'll have to save this recipe for next summer's tomatoes. I can hardly wait! Is it bad that i want to eat this right now even though it's 1:30 am? It looks amazing! On Firday I went to a cafe with my husband and had two small tarts, and I told him that maybe I can make it at home, but thinking in our kids that maybe they are not going to like it, I remove it from my mind. But know, I saw it here...a kind of sign? Well, I have to try, what do you think?